§ 166-1 Scope and purpose. § 166-2 Word usage; definitions. § 166-3 Design and performance standards for stormwater management measures. § 166-4 Requirements for major development. § 166-5 Calculation of stormwater runoff and groundwater recharge. § 166-6 Standards for structural stormwater management measures. § 166-7 Sources for technical guidance. § 166-8 Safety standards for stormwater management basins. § 166-9 Site development stormwater plan requirements. § 166-10 Maintenance and repair requirements. § 166-11 Violations and penalties. Flood damage prevention — See Ch. 96. Sewers and sewage disposal — See Ch. 156. Subdivision of land — See Ch. 170. Water — See Ch. 185. Policy statement. Stormwater management is the process of minimizing stormwater runoff and directing stormwater-appropriate nonstructural and structural stormwater management measures so as to control flooding, recharge groundwater and reduce pollution of water resources. Transport of stormwater-related pollutants into the local surface waters and groundwaters can result in the destruction of fish, wildlife, and habitats, threats to public health due to contaminated food and drinking water supplies, and losses of recreational and aesthetic values. Stormwater management shall occur with the understanding and acceptance of stormwater as a resource; low-impact and nonstructural measures shall be tailored to a site and applied wherever and to the extent feasible. Protect groundwater resources from degradation and diminution. Aspects of residential major developments that are not preempted by the Residential Site Improvement Standards (RSIS) at N.J.A.C. 5:21. The provisions of both this chapter and the RSIS are to be applied and reviewed concurrently for any residential major development. In the case of agricultural or horticultural development that meets the definition of "major development" under N.J.A.C. 7:8, a farm conservation plan that addresses the protection of soil and water resources shall be developed and implemented. Such a plan shall be approved by the Hunterdon County Soil Conservation District. This chapter shall also be applicable to all major developments undertaken by the Borough of Milford. This chapter does not apply to activities of Hunterdon County, the State of New Jersey and the government of the United States of America when those activities are specifically exempted from municipal regulation by relevant state or federal law. Compatibility with other permit and ordinance requirements. Development approvals issued for subdivisions and site plans pursuant to this chapter are to be considered an integral part of development approvals under the subdivision and site plan review process and do not relieve the applicant of the responsibility to secure required permits or approvals for activities regulated by any other applicable code, rule, act, or ordinance. In their interpretation and application, the provisions of this chapter shall be held to be the minimum requirements for the promotion of the public health, safety, and general welfare. This chapter shall be construed to assure consistency with the requirements of New Jersey laws and acts amendatory thereof or supplementary thereto, applicable implementing regulations, and any existing or future municipal NJPDES permits and any amendments or revisions thereto or reissuance thereof. This chapter is not intended to interfere with, abrogate, or annul any other ordinance, rule or regulation, statute, or other provision of law. Where any provision of this chapter imposes restrictions different from those imposed by any other ordinance, rule or regulation, or other provision of law, whichever provisions are more restrictive or impose higher standards shall control. Unless specifically defined below, words or phrases used in this chapter shall be interpreted so as to give them the meanings they have in common usage and to give this chapter its most reasonable application. Where common definitions exist, the definitions below are the same as or based on the corresponding definitions in the stormwater management rules at N.J.A.C. 7:8-1.2. Construction for the purposes of supporting common farmsite activities, including but not limited to the production, harvesting, storage, grading, packaging, processing, and the wholesale and retail marketing of crops, plants, animals, and other related commodities and the use and application of techniques and methods of soil preparation and management, fertilization, weed, disease, and pest control, disposal of farm waste, irrigation, drainage and water management, and grazing. The use of the land for common farmsite activities, including but not limited to production, harvesting, storage, grading, packaging, processing and the wholesale and retail marketing of crops, plants, animals and other related commodities and the use and application of techniques and methods of soil preparation and management, fertilization, weed, disease and pest control, disposal of farm waste, irrigation, drainage and water management, and grazing. Waters of the state designated in N.J.A.C. 7:9B. The increase in soil bulk density caused by subjecting soil to greater-than-normal loading. Compaction can also decrease soil infiltration and permeability rates. The Hunterdon County Planning Board, as designated by the County Board of Chosen Freeholders to review municipal stormwater management plans and implementing ordinance(s). A state development and redevelopment plan center, such as urban, regional, town, village, or hamlet, as designated by the State Planning Commission. The division of a parcel of land into two or more parcels, the construction, reconstruction, conversion, structural alteration, relocation or enlargement of any building or structure, any mining excavation or landfill, and any use or change in the use of any building or other structure, or land or extension of use of land, by any person, for which permission is required under the Municipal Land Use Law, N.J.S.A. 40:55D-1 et seq. In the case of development of agricultural lands, "development" means any activity that requires a state permit, any activity reviewed by the County Agricultural Board (CAB) and the State Agricultural Development Committee (SADC), and municipal review of any activity not exempted by the Right to Farm Act, N.J.S.A. 4:1C-1 et seq. Any activity including the clearing, excavating, storing, grading, filling or transportation of soil or any other activity that causes soil to be exposed to the danger of erosion. An area or feature which is of significant environmental value, including but not limited to stream corridors; natural heritage priority sites; habitat of endangered or threatened species; large areas of contiguous open space or upland forest; steep slopes; wellhead protection areas; and groundwater recharge areas. Habitats of endangered or threatened species are those identified by the Department's Landscape Project as approved by the Department's Endangered and Nongame Species Program, or by the Department pursuant to the Highlands Act at N.J.S.A. 13:20-32k and 13:20-34a(4). A body of water below the surface of the land in a zone of saturation where the spaces between the soil or geological materials are fully saturated with water. The Highlands Water Protection and Planning Act, P.L. 2004, c. 120, codified at N.J.S.A. 13:20-1 et seq., as amended. A watershed as defined by the United States Geological Survey with a fourteen-digit identifier; a subwatershed. A surface that has been covered with a layer of material so that it is highly resistant to infiltration by water relative to natural conditions in the area. The process by which water from precipitation seeps into the soil to a level below the normal root soil of plant species. An area where karst topography, with its characteristic surface and subterranean features, is developed as a result of the dissolution of limestone, dolomite, or other soluble rock. Characteristic physiographic features present in karst terrains include but are not limited to sinkholes, sinking streams, caves, blind valleys, large springs and subterranean drainage. See also "limestone area." An area of Hunterdon County underlain by carbonate sedimentary rock consisting chiefly of calcium carbonate. Limestone is commonly used as a general term for the class of rocks that consist of at least 80% calcium or magnesium carbonate. See also "karst terrain." Methods incorporating design measures to replicate predevelopment hydrology to reduce the impacts of development at a lot-level basis, treating rainwater where it falls by creating conditions that allow the water to infiltrate back into the ground. LID emphasizes greater infiltration of stormwater on site rather than regarding the stormwater as a nuisance condition and disposable. A document required for all major development projects for stormwater management maintenance. The document shall contain specific preventive maintenance tasks and schedules; cost estimates, including estimated cost of sediment, debris, or trash removal; and the name, address, and telephone number of the person or persons responsible for preventive and corrective maintenance (including replacement). Any development that provides for ultimately disturbing one or more acres of land or would create 1/4 acre or more of new impervious surface, except that, within the Highlands Preservation Area, "major development" shall mean major highlands development, as defined at N.J.A.C. 7:38-1.4. Compliance with the specific objective to the greatest extent possible, taking into account equitable considerations and competing factors, including but not limited to environmental benefits, pollutant removal effectiveness, regulatory compliance, ability to implement given site-specific environmental conditions, cost and technical or engineering feasibility. An action by an applicant providing compensation or offset actions for on-site stormwater management requirements where the applicant has demonstrated the inability or impracticality of strict compliance with the stormwater management requirements set forth in N.J.A.C. 7:8, in an adopted regional stormwater management plan, or in this chapter, and has received a waiver from strict compliance from the municipality. Mitigation, for the purposes of this chapter, includes both the mitigation plan detailing how the project's failure to strictly comply will be compensated, and the implementation of the approved mitigation plan within the same HUC-14 within which the subject project is proposed (if possible and practical), or a contribution of funding toward a regional stormwater control project, or provision for equivalent treatment at an alternate location, or other equivalent water quality benefit. An area designated by the State Planning Commission concentrating facilities and activities that are not organized in a compact form. Techniques that control or reduce stormwater runoff in the absence of stormwater structures (e.g., basins and piped conveyances), such as minimizing site disturbance, preserving important site features, including but not limited to natural vegetation, reducing and disconnecting impervious cover, minimizing slopes, utilizing native vegetation, minimizing turf grass lawns, increasing time of concentration and maintaining and enhancing natural drainage features and characteristics. A chemical element or compound, such as nitrogen or phosphorus, which is essential to and promotes the development of plants, algae and other organisms or vegetation. The amount of a nutrient in a defined volume of water (such as milligrams of nitrogen per liter). The relationship between nutrient concentration and nutrient load can vary and depends on the surface water flow, the volume of water in the water body or aquifer, and watershed characteristics. The total amount of a nutrient such as nitrogen or phosphorus entering the water during a given time, such as "tons of nitrogen per year" or "pounds of phosphorus per day." Nutrients may enter the water from runoff, groundwater recharge, point source discharges, or the air (in the form of wet deposition such as rain or snow as well as dry deposition). A surface or land cover capable of transmitting or percolating a significant amount of precipitation into the underlying soils. Any individual, corporation, company, partnership, firm, association, the Borough of Milford, or political subdivision of this state subject to municipal jurisdiction pursuant to the Municipal Land Use Law, N.J.S.A. 40:55D-1 et seq. Any dredged spoil, solid waste, incinerator residue, filter backwash, sewage, garbage, refuse, oil, grease, sewage sludge, munitions, chemical wastes, biological materials, medical wastes, radioactive substance [except those regulated under the Atomic Energy Act of 1954, as amended (42 U.S.C. § 2011 et seq. )], thermal waste, wrecked or discarded equipment, rock, sand, cellar dirt, industrial, municipal, agricultural, and construction waste or runoff, or other residue discharged directly or indirectly to the land, groundwaters or surface waters of the state, or to a domestic treatment works. "Pollutant" includes both hazardous and nonhazardous pollutants. The man-made or man-induced alteration of the chemical, physical, biological, and radiological integrity of water to the extent that the pollutant concentration or level violates either the Ground Water Quality Standards (N.J.A.C. 7:9C) or the Surface Water Quality Standards (N.J.A.C. 7:9B) of New Jersey. Prior to the proposed major development. The amount of water from precipitation that infiltrates into the ground and becomes part of a groundwater body. The municipal body or official that is responsible for the review of a major development project for compliance with the stormwater management requirements. Solid material, mineral or organic, that is in suspension and is being transported or has been moved from its site of origin by air, water or gravity as a product of erosion. Sediment, debris, trash, and other floating, suspended, or settleable solids. Any material(s) or machinery, located at an industrial facility, that is directly or indirectly related to process, manufacturing, or other industrial activities, that could be a source of pollutants in any industrial stormwater discharge to groundwater or surface water. Source materials include, but are not limited to, raw materials, intermediate products, final products, waste materials, by-products, industrial machinery and fuels, and lubricants, solvents, and detergents that are related to process, manufacturing, or other industrial activities that are exposed to stormwater. An excavation or embankment and related areas designed to retain stormwater runoff. A stormwater management basin may either be normally dry (that is, a detention basin or infiltration basin), retain water in a permanent pool (a retention basin), or be planted mainly with wetland vegetation (a constructed stormwater wetland). The flow of stormwater on or across the surface of the ground, in drainage facilities or in storm sewers. A strip of land located immediately adjacent to a stream channel consisting of natural, undisturbed vegetative cover, which serves as a transition area between uplands and riparian lands. A stream buffer may encompass wetlands, may be contained with a floodplain or floodway or may extend beyond a wetland, floodplain or floodway boundary. A stormwater management measure that involves control of concentrated stormwater runoff or infiltration such as stormwater basins, piped conveyance systems and manufactured stormwater devices, and can include various types of basins, filters, surfaces, and devices located on individual lots in a residential development or throughout a commercial, industrial, or institutional development site in areas not typically suited for larger, centralized structural facilities. 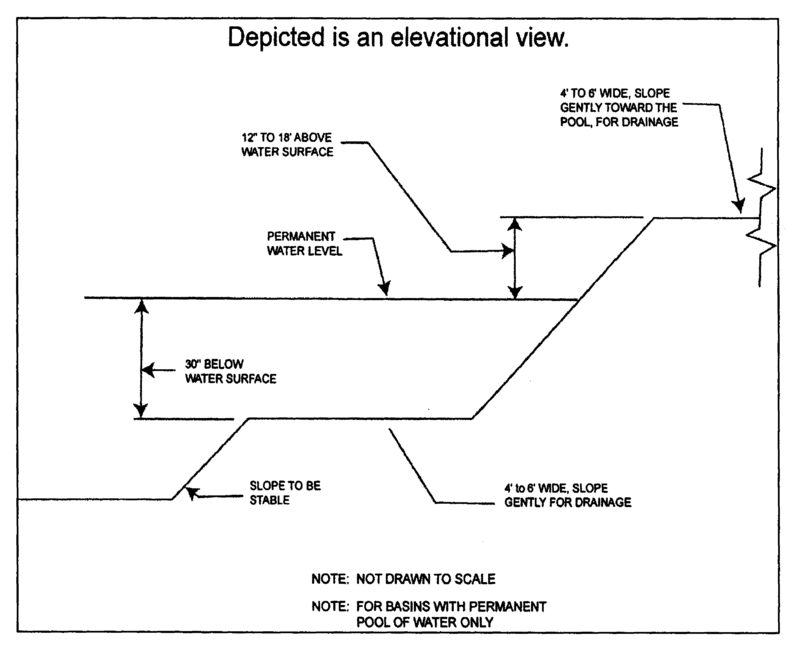 The downstream surface water elevation at a discharge (pipe, weir, spillway, channel, etc.). Endangered species are those whose prospects for survival in New Jersey are in immediate danger because of a loss or change in habitat, overexploitation, predation, competition, disease, disturbance or contamination. Assistance is needed to prevent future extinction in New Jersey. Threatened species are those who may become endangered if conditions surrounding them begin to or continue to deteriorate. Habitats of endangered or threatened species are those identified by the Department's Landscape Project as approved by the Department's Endangered and Nongame Species Program, or by the Department pursuant to the Highlands Act at N.J.S.A. 13:20-32k and 13:20-34a(4). The time it takes for stormwater runoff to travel from the hydraulically most distant point of the watershed to the point of interest within a watershed. An area of protected upland adjacent to a freshwater wetland that minimizes adverse impacts on the wetland or serves as an integral component of the wetlands ecosystem. Also called "buffer area." The ocean and its estuaries and all springs, streams, wetlands, and bodies of surface water or groundwater, whether natural or artificial, within the boundaries of the State of New Jersey or subject to its jurisdiction. Stormwater management measures for major development shall be designed to meet the erosion control, groundwater recharge, and stormwater runoff quantity and quality standards in § 166-4, as described in technical guidance documents listed in § 166-7. As detailed in § 166-4, to the maximum extent practicable, these standards shall be met by incorporating nonstructural stormwater management strategies into the design. If these strategies alone are not sufficient to meet these standards, structural stormwater management measures necessary to meet these standards shall be incorporated into the design along with the practicable nonstructural strategies. The standards in this chapter apply to new major development and are intended to minimize the impact of stormwater runoff on water quality and water quantity in receiving water bodies and maintain groundwater recharge. The standards do not apply to major development to the extent that alternative design and performance standards are applicable under a regional stormwater management plan or water quality management plan adopted in accordance with Department rules. To the maximum extent practicable, the standards in Subsections B and C of this section shall be met by incorporating nonstructural stormwater management strategies set forth in this subsection into the design. The applicant shall identify the nonstructural measures incorporated into the design of the project by preparation of the NJDEP Nonstructural Strategies Points System (NSPS) spreadsheet and, if further review of proposed nonstructural measures is necessary, the preparation of the NJDEP low-impact development checklist. If the applicant contends that it is not feasible for engineering, environmental, or safety reasons to incorporate any or only specific nonstructural stormwater management measures identified in Subsection A(2) below into the design of a particular project, the applicant shall identify the strategy or strategies considered and provide a basis for the contention. The applicant bears the burden of proving any impracticability. Protect areas that provide water quality benefits or areas particularly susceptible to erosion and sediment loss. Minimize the creation of new impervious surfaces and reduce, break up or otherwise disconnect the flow of runoff over impervious surfaces. Maximize the protection of natural drainage features and vegetation, except where native or natural vegetation is considered invasive. Minimize the decrease in the time of concentration from preconstruction to post-construction. Minimize land clearing and disturbance and overall site grading. Retain native, noninvasive vegetation, plant low-maintenance landscaping, plant native vegetation, and minimize the creation of lawns to reduce the use of fertilizers, pesticides and irrigation. Provide vegetated open-channel conveyance systems discharging into and through stable vegetated areas. When establishing vegetation after land disturbance, application of fertilizer in accordance with the requirements established under the Soil Erosion and Sediment Control Act, N.J.S.A. 4:24-39 et seq., and implementing rules. Prior to applying fertilizer, soil tests must be conducted on site to determine the type of fertilization necessary. Site design features identified under Subsection A(2)(i) above shall comply with the following standard to control passage of solid and floatable materials through storm drain inlets. For exemptions to this standard, see Subsection A(3)(c) below. A different grate, if each individual clear space in that grate has an area of no more than seven square inches or is no greater than 0.5 inch across the smallest dimension. Whenever design engineers use a curb-opening inlet, the clear space in that curb opening (or each individual clear space, if the curb opening has two or more clear spaces) shall have an area of no more than seven square inches or be no greater than two inches across the smallest dimension. Subject to an approved equivalent restriction that ensures that measure or an equivalent stormwater management measure approved by the reviewing agency is maintained in perpetuity. Guidance for nonstructural stormwater management strategies is available in the New Jersey Stormwater Best Management Practices Manual. The BMP Manual may be obtained from the address identified in § 166-7 or found on the Department's website at www.njstormwater.org. Erosion control, groundwater recharge and stormwater runoff quantity control standards. This subsection contains minimum design and performance standards to control erosion, maintain groundwater recharge, and control stormwater runoff quantity impacts of major development. Areas where recharge would be inconsistent with a Department-approved remedial action work plan or landfill closure plan and areas with high risks for spills of toxic materials, such as gas stations and vehicle maintenance facilities. Stormwater runoff from industrial areas exposed to source material. The design engineer shall assess the hydraulic impact on the groundwater table and design the project site and all site groundwater recharge measures so as to avoid adverse hydraulic impacts. Adverse hydraulic impacts include, but are not limited to, raising the groundwater table so as to cause surface ponding, flooding of basements and other subsurface facilities, and interference with the proper operation of subsurface sewage disposal systems and other subsurface structures in the vicinity of a groundwater recharge measure. Design stormwater management measures so that the post-construction peak runoff rates for the two-, ten-, and one-hundred-year storm events are 50%, 75% and 80%, respectively, of the preconstruction peak runoff rates. The percentages apply only to the post-construction stormwater runoff that is attributable to the portion of the site on which the proposed development or project is to be constructed. Any application for a new agricultural or horticultural development that meets the definition of "major development" in § 166-2 shall be submitted to the Hunterdon County Soil Conservation District for review and approval in accordance with the requirements of this section and any applicable Soil Conservation District guidelines for stormwater runoff quantity and erosion control. Stormwater management measures shall be designed to reduce the post-construction load of total suspended solids (TSS) in stormwater runoff by 80% of the anticipated load from the developed site, expressed as an annual average. Stormwater management measures shall only be required for water quality control if an additional 1/4 acre or more of impervious surface is being proposed on a development site. The requirement to reduce TSS does not apply to any stormwater runoff in a discharge regulated under a numeric effluent limitation for TSS imposed under the New Jersey Pollutant Discharge Elimination System (NJPDES) rules, N.J.A.C. 7:14A, or in a discharge specifically exempt under a NJPDES permit from this requirement. Daily limits of TSS (TMDL) may apply to the site development based on conditions of regulatory approvals. The water quality design storm shall be 1.25 inches of rainfall in two hours. Water quality calculations shall take into account the distribution of rain from the water quality design storm, as reflected in Table 1, subject to revision due to subsequent rule changes. The calculation of the volume of runoff may take into account the implementation of nonstructural and structural stormwater management measures. For purposes of TSS reduction calculations, Table 2 below presents the presumed removal rates for certain BMPs designed, constructed and maintained in accordance with the New Jersey Stormwater Best Management Practices Manual, subject to revision due to subsequent rule changes. The current edition of the BMP Manual may be obtained from the address identified in § 166-7 or found on the Department's website at www.njstormwater.org. The BMP Manual and other sources of technical guidance are listed in § 166-7. TSS reduction shall be calculated based on the removal rates for the BMPs in Table 2 below. Alternative BMPs, removal rates and methods of calculating removal rates may be approved if the design engineer provides documentation demonstrating the capability of these alternative BMPs, removal rates and computational methods to the review agency. Documentation for alternative rates and methods shall consist of published (peer-reviewed) journal article or scientific paper. A copy of any approved alternative rate or method of calculating the removal rate, including documentation, shall be provided to the Department at the following address: Division of Watershed Management, New Jersey Department of Environmental Protection, P.O. Box 418, Trenton, New Jersey 08625-0418. Total TSS percent load removal (expressed as a whole number) from application of both BMPs. The TSS percent removal rate (whole number) applicable to the first (upstream) BMP. The TSS percent removal rate (whole number) applicable to the second (downstream) BMP. In cases where three (or more) BMPs are used in series, the applicant shall calculate the TSS reduction for the two most upstream BMPs in the series using the above formula, then substitute the result (R) of that calculation in the formula for "A" when calculating the combined result with the next BMP in the series. If there is more than one on-site drainage area, the 80% TSS removal rate shall apply to the discharge of each drainage subarea, unless the runoff from the subareas converges on site, in which case the removal rate can be demonstrated through a calculation using an area-weighted average. Stormwater management measures shall also be designed to reduce, to the maximum extent practicable, the post-construction nutrient load from the developed site in stormwater runoff generated from the water quality design storm. In achieving reduction of nutrients to the maximum extent practicable, the design of the site shall include nonstructural strategies and structural measures that optimize nutrient removal while still achieving the performance standards in Subsections B and C. This standard may be superseded by a more stringent numeric effluent limitation imposed under the New Jersey Pollutant Discharge Elimination System (NJPDES) rules, N.J.A.C. 7:14A, or in a discharge specifically exempt under a NJPDES permit from this requirement. Daily limits for nutrient loading (TMDL) may apply to the site development based on conditions of regulatory approvals. Additional information and examples are contained in the New Jersey Stormwater Best Management Practices Manual, which may be obtained from the address identified in § 166-7. In accordance with the definition of "FW1" at N.J.A.C. 7:9B-1.4, stormwater management measures shall be designed to prevent any increase in stormwater runoff and any new stormwater discharge point to waters classified as FW1. Encroachment within the designated special water resource protection area under Subsection C(9)(a) above shall only be allowed where previous development or disturbance has occurred (for example, preexisting active agricultural use, parking area or maintained lawn area). The encroachment shall only be allowed where the applicant demonstrates that the functional value and overall condition of the special water resource protection area will be maintained to the maximum extent practicable. In no case shall the remaining special water resource protection area be reduced to less than 150 feet as measured perpendicular to the top of bank of the waterway or center line of the waterway where the bank is undefined. All encroachments proposed under this subsection shall be subject to review and approval by the Department. All encroachments proposed under this section shall be reviewed and approved by the Department. A stream corridor protection plan for a waterway subject to Subsection C(9) shall maintain or enhance the current functional value and overall condition of the special water resource protection area as defined in Subsection C(9)(a) above. In no case shall a stream corridor protection plan allow the reduction of the special water resource protection area to less than 150 feet as measured perpendicular to the waterway subject to this subsection. Subsection C(9) does not apply to the construction of one individual single-family dwelling that is not part of a larger development and is on a lot receiving preliminary or final subdivision approval on or before February 2, 2004, provided that the construction begins on or before February 2, 2009. Maintenance plan. The development shall incorporate a maintenance plan for the stormwater management measures incorporated into the design of a major development in accordance with § 166-10. The construction of a public pedestrian access, such as a sidewalk or trail with a maximum width of 14 feet, provided that the access is constructed of permeable material such as wood chips, unpacked gravel, and porous pavement (see § 166-7 for guidance). The applicant demonstrates that it does not own or have other rights to areas, including the potential to obtain through condemnation lands not falling under Subsection F(1)(c) above, within the upstream drainage area of the receiving stream that would provide additional opportunities to mitigate the requirements of Subsections B and C that were not achievable on site. A waiver from strict compliance with the requirements of Subsections B and C may be issued in those cases where an applicant has demonstrated the inability or impracticality of strict compliance, other than projects addressed under Subsection F(1), with the stormwater management requirements set forth in N.J.A.C. 7:8, in an adopted regional stormwater management plan, or in a local ordinance which is as strict as N.J.A.C. 7:8. Waivers from strict compliance cannot be granted until such time that the Municipal Stormwater Management Plan (MSWMP) is amended to incorporate a specific mitigation strategy. Applicants requesting waivers from strict compliance must propose a suitable mitigation method through submission of a mitigation plan. Threatened and endangered species. When habitat for threatened and endangered species (see definition for "environmentally critical area" in § 166-2) is present on a site, stormwater management measures implemented shall avoid adverse impacts caused by pollutant discharge, the creation of concentrated flow, or the alteration of recharge. The Rational Method for peak stormwater runoff rate calculations and the Modified Rational Method for stormwater runoff hydrograph calculations. Use of the Rational Method and Modified Rational Method is limited to drainage areas of 20 acres or less. Neither the Rational Method nor Modified Rational Method shall be used to calculate runoff volumes for groundwater recharge or stormwater runoff infiltration purposes. When selecting or calculating runoff coefficients for preconstruction project site conditions using any of the above methods, the project site's land cover shall be assumed to be woods. However, another land cover may be used to calculate runoff coefficients if such land cover has existed at the site or portion thereof without interruption for at least five years immediately prior to the time of application and the design engineer can document the character and extent of such land cover through the use of photographs, affidavits, and/or other acceptable land use records. If more than one land cover other than woods has existed on the site during the five years immediately prior to the time of application, the land cover with the lowest runoff potential (including woods) shall be used for the computations. All preconstruction land covers shall be assumed to be in good hydrologic condition and, if cultivated, shall be assumed to have applied appropriate conservation practices. In calculating preconstruction site stormwater runoff, the design engineer shall include the effects of all land features and structures, such as ponds, wetlands, depressions, hedgerows and culverts, that reduce preconstruction site stormwater runoff rates and/or volumes. In calculating stormwater runoff using the NRCS methodology, the design engineer shall use appropriate twenty-four-hour rainfall depths as developed for the project site by the National Oceanic and Atmospheric Administration. In calculating stormwater runoff using the NRCS methodology, the design engineer shall separately calculate and then combine the runoff volumes from pervious and directly connected impervious surfaces within a drainage area. Calculation of stormwater runoff from unconnected impervious surfaces shall be based, as applicable, upon the two-step methodology as described in the Department's current Stormwater Best Management Practices Manual or the NRCS methodology described in the current Technical Release 55, Urban Hydrology for Small Watersheds. In complying with the design and performance standards in § 166-4B(1)(b)[a], the design engineer may calculate groundwater recharge in accordance with the New Jersey Groundwater Recharge Spreadsheet (NJGRS) computer program as described in the Department's current Stormwater Best Management Practices Manual. In complying with the design and performance standards in § 166-4B(1)(b)[b], the design engineer shall calculate stormwater runoff infiltration volumes in accordance with the USDA Natural Resources Conservation Service (NRCS) methodology, including the NRCS Runoff Equation, as described in the current NRCS National Engineering Handbook Part 630, Hydrology, and the current Technical Release 55, Urban Hydrology for Small Watersheds. In addition, the design engineer shall use appropriate two-year, twenty-four-hour rainfall depths as developed for the project site by the National Oceanic and Atmospheric Administration. When selecting or calculating runoff coefficients for preconstruction project site conditions for groundwater recharge or stormwater runoff infiltration calculations, the project site's land cover shall be assumed to be woods. However, another land cover may be used to calculate runoff coefficients if such land cover has existed at the site or portion thereof without interruption for at least five years immediately prior to the time of application and the design engineer can document the character and extent of such land cover through the use of photographs, affidavits, and/or other acceptable land use records. If more than one land cover other than woods has existed on the site during the five years immediately prior to the time of application, the land cover with the lowest runoff potential (including woods) shall be used for the computations. All preconstruction land covers shall be assumed to be in good hydrologic condition and, if cultivated, shall be assumed to have conservation treatment. Structural stormwater management measures shall be designed to factor into the design the existing site conditions, including, for example, environmentally critical areas; wetlands; flood-prone areas; slopes; depth to seasonal high-water table; soil type, permeability and texture; drainage area and drainage patterns; existing or former mines; significant land filling; and the presence of solution-prone carbonate rocks (limestone) and related karst topography. Structural stormwater management measures shall be designed to minimize maintenance, facilitate maintenance and repairs, and ensure proper functioning. Trash racks shall be installed at the intake to the outlet structure as appropriate and shall have parallel bars with one-inch spacing between the bars to the elevation of the water quality design storm. For elevations higher than the water quality design storm, the parallel bars at the outlet structure shall be spaced no greater than 1/3 the width of the diameter of the orifice or 1/3 the width of the weir, with a minimum spacing between bars of one inch and a maximum spacing between bars of six inches. In addition, the design of trash racks must comply with the requirements of § 166-8B. Structural stormwater management measures shall be designed, constructed, and installed to be strong, durable, and corrosion-resistant. Measures that are consistent with the relevant portions of the Residential Site Improvement Standards at N.J.A.C. 5:21-7.3, 5:21-7.4, and 5:21-7.5 shall be deemed to meet this requirement. The measures are to be sequenced in the site development process so that erosion control standards are met and so the measure is not compromised or impaired by construction runoff. Stormwater management basins shall be designed to meet the minimum safety standards for stormwater management basins at § 166-8. Where tailwater will affect the hydraulic performance of a stormwater management measure, the design engineer shall include such effects in the measure's design. Guidelines for management measures. Stormwater management measure guidelines are available in the New Jersey Stormwater Best Management Practices Manual and other documents as described in § 166-7. Other stormwater management measures may be utilized, provided that the design engineer demonstrates to the satisfaction of the review agency that the proposed measure and its design will accomplish the required water quantity, groundwater recharge and water quality design and performance standards established by § 166-4 of this chapter. Manufactured treatment devices may be used to meet the requirements of § 166-4 of this chapter, provided that the pollutant removal rates are verified by the New Jersey Corporation for Advanced Technology and certified by the Department. Manufactured treatment devices may be used only where the maintenance plan required by § 166-10 ensures that the manufactured device will be properly maintained for its functional life span and will be replaced as needed with management measures that are at least as effective as the original manufactured treatment device working in accordance with manufacturer's specifications. Primary technical guidance. Technical guidance for stormwater management measures can be found in the documents listed at Subsection A(1) and (2) below, which are available from Maps and Publications, New Jersey Department of Environmental Protection, 428 East State Street, P.O. Box 420, Trenton, New Jersey 08625; telephone: (609) 777-1038. Guidelines for stormwater management measures are contained in the New Jersey Stormwater Best Management Practices Manual, as amended. Information is provided on stormwater management measures, such as bioretention systems, constructed stormwater wetlands, dry wells, extended detention basins, infiltration structures, manufactured treatment devices, pervious paving, sand filters, vegetative filter strips, and wet ponds. This document is also available at www.njstormwater.org. The New Jersey Department of Environmental Protection Stormwater Management Facilities Maintenance Manual (NJDEP Ocean County Demonstration Study, Stormwater Management Facilities Maintenance Manual, dated June 1989), as amended. The Standards for Soil Erosion and Sediment Control in New Jersey promulgated by the State Soil Conservation Committee and incorporated into N.J.A.C. 2:90. Copies of these standards may be obtained by contacting the State Soil Conservation Committee, P.O. Box 330, Trenton, New Jersey 08625, (609) 292-5540, or the Hunterdon County Soil Conservation District, 687 Pittstown Road, Suite 1, Frenchtown, New Jersey 08825, (908) 788-1397. The Rutgers Cooperative Extension Service, (732) 932-9306. The Hunterdon County Soil Conservation District, 687 Pittstown Road, Suite 1, Frenchtown, New Jersey 08825, (908) 788-1397. The United States Environmental Protection Agency, including the National Management Measures to Control Nonpoint Source Pollution from Urban Areas, available at the website: http://www.epa.gov/owow/nps/urbanmm/index.html. Field guides of the United States Department of Agriculture, Natural Resources Conservation Service, where supplemental to and not conflicting with a source of primary guidance in Subsection A of this section. Other similarly authoritative governmental or trade association sources acceptable to the reviewing agency. General scope. This section sets forth requirements to protect public safety through the proper design and operation of stormwater management basins. This section applies to any new stormwater management basin. The trash rack shall not adversely affect the hydraulic performance of either the outlet structure opening it is protecting or the overall outlet structure. The trash rack shall have sufficient net open area under clean conditions to limit the peak design storm velocity through it to a maximum of 2.5 feet per second. The trash rack shall be constructed and installed to be rigid, durable, and corrosion-resistant and shall be designed to withstand a perpendicular live loading of 300 pounds per square foot. The overflow grate spacing shall be no more than two inches across the smallest dimension. The overflow grate shall be constructed and installed to be rigid, durable, and corrosion-resistant and shall be designed to withstand a perpendicular live loading of 300 pounds per square foot. If a structural stormwater management measure has an outlet structure, escape provisions shall be incorporated in or on the structure. "Escape provisions" means the permanent installation of ladders, steps, rungs, or other features that provide readily accessible means of ingress and egress from the outlet structure. Safety ledges shall be constructed on the slopes of all new structural stormwater management measures having a permanent pool of water deeper than 2 1/2 feet. Such safety ledges shall be comprised of two steps. Each step shall be four to six feet in width. One step shall be located approximately 2 1/2 feet below the permanent water surface, and the second step shall be located one to 1 1/2 feet above the permanent water surface. 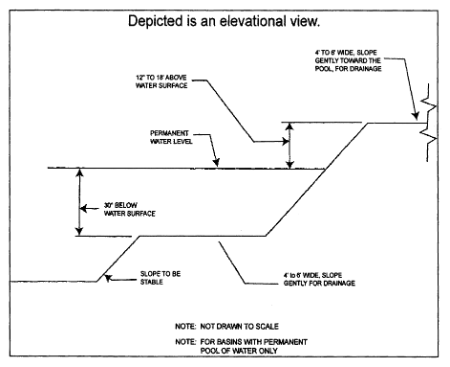 See Subsection D of this section for an illustration of safety ledges in a stormwater management basin. In new stormwater management basins, the maximum slope of the interior and exterior of an earthen dam, embankment, or berm shall not be steeper than three horizontal to one vertical, in accordance with N.J.A.C. 7:8-6.2(c)3. An emergency drawdown method for detention basins is required where the permanent pool will be more than 2 1/2 feet deep. This drawdown method must consider downstream or off-site stability at the outfall in accordance with the Standards for Soil Erosion and Sediment Control in New Jersey. Whenever an applicant seeks municipal approval of a development subject to this chapter, the applicant shall submit all of the submission requirements for the site development stormwater plan at Subsection C below as part of the submission of the applicant's application for subdivision or site plan approval. The applicant shall demonstrate through the submission requirements that the project meets the standards set forth in this chapter. The applicant shall submit to the approving municipal authority the required number of copies of the materials listed in the submission requirements for site development stormwater plans in accordance with Subsection C of this section. Site development stormwater plan approval. The applicant's site development project shall be reviewed as a part of the subdivision or site plan review process by the municipal board or official from which municipal approval is sought (the review agency). That review agency shall consult the Milford Borough Joint Land Use Board Engineer to determine if all of the checklist requirements have been satisfied and to determine if the project meets the standards set forth in this chapter. Submission requirements. The information in Subsection C(1) through (7) below shall be provided unless a waiver is approved through Subsection C(8) below. Perennial or intermittent streams as shown on the USGS 7.5 minute quadrangle maps and as indicated in the Soil Survey of Hunterdon County, New Jersey. Special water resource protection areas along all waters designated Category One at N.J.A.C. 7:9B and perennial or intermittent streams that drain into or upstream of the Category One waters as shown on the USGS quadrangle maps or in the County Soil Survey. Wetlands, transition areas, NJDEP linear nontidal wetlands, marshlands and NJDEP letter of interpretation findings. FEMA Q3 Flood Data one-hundred-year floodplains and floodways. Geometry of on-site drainage areas. Appropriate buffers to streams, rivers, wetlands, marshlands, ponds, lakes and other water bodies as specified in pertinent ordinances, rules, regulations, statutes or other provisions of law imposed by local, county, state or federal agencies. Existing and proposed bearing and distances of property lines. Existing and proposed conservation, maintenance, construction, reconstruction, sight, utility, drainage and right-of way easements and dedications. Pervious and vegetated surfaces, i.e., woodlands, grasslands and other significant natural features not listed if being utilized for LID credit. Native and invasive stands of vegetation. Vegetated habitat for threatened and endangered species. Steep slopes, 10% or greater slopes. Highly erodible soils, with an erodibility factor (K) of 0.40 or less. Drainage class and recharge potential. Soils subject to dynamic compaction and compacted soils. Existing buildings and significant permanent man-made features. Roads by classification, parking areas and other impervious surfaces. Utilities, subsurface and above ground. Mining/quarry operations and blasting areas. Acid or other hazardous runoff. Areas of fill and buried debris. Wellheads and associated groundwater withdrawal pipes, discharges and BMPs of existing stormwater utilities. Septic systems and wells of adjacent lots. Previous land use (agricultural, industrial, commercial). Environmental site analysis. A written and graphic description of the natural and man-made features of the site and its environs. This description should include a discussion of soil conditions, slopes, wetlands, waterways and vegetation on the site. Particular attention should be given to unique, unusual, or environmentally critical areas and to those that provide particular opportunities or constraints for development. Project description and site plan(s). A map (or maps) at a scale appropriate for the site indicating the location of existing and proposed buildings, roads, parking areas, utilities, structural facilities for stormwater management and sediment control, and other permanent structures. The map(s) shall also clearly show areas where alterations occur in the natural terrain and cover, including lawns and other landscaping, and seasonal high-groundwater elevations. A written description of the site plan and justification of proposed changes in natural conditions may also be provided. Stormwater site planning and design summary. This plan shall provide a demonstration of how the goals and standards of §§ 166-3 through 166-6 are being met, including both nonstructural and structural approaches. The focus of this plan shall be to describe how the site is being managed or developed to meet the objective of controlling groundwater recharge, stormwater quality and stormwater quantity problems at the source by land management and source controls whenever possible. Refer to the municipal stormwater management plan and/or the municipal stormwater pollution prevention plan for additional requirements. It should explain in full the information required by Subsection C.
Total area to be paved or built upon, proposed surface contours, land area to be occupied by the stormwater management facilities and the type of vegetation thereon, land area to remain in natural vegetation, and details of the proposed plan to infiltrate, manage, control and dispose of stormwater. Details of all stormwater management facility designs, during and after construction, including discharge provisions, discharge capacity for each outlet at different levels of detention, and emergency spillway provisions with maximum discharge capacity of each spillway. Comprehensive hydrologic and hydraulic design and discharge stability calculations for the predevelopment and post-development conditions for the design storms specified in § 166-4 of this chapter. When the proposed stormwater management control measures (e.g., infiltration basins) depend on the hydrologic properties of soils, then a soils report shall be submitted. The soils report shall be based on on-site boring logs or soil pit profiles. The number and location of required soil borings or soil pits shall be determined based on what is needed to determine the suitability and distribution of soils present at the location of the control measure. The municipality shall be notified of site investigation activities and given the opportunity to have a witness, either prior to approval or as a condition of approval, as appropriate for the specific type of measure. Subsequent to approval of the major development, post-construction bulk soil density and infiltration testing shall be required for all infiltration measures that were used as justification for meeting the recharge standard, to ensure that they were properly constructed. The standards in N.J.A.C. 7:9A-6.4 through 7:9A-6.7 for on-site infiltration testing shall be adhered to. Maintenance and repair plan. The design and planning of the stormwater management facility shall meet the maintenance requirements of § 166-10. Waiver from submission requirements. The review agency may, in consultation with the Municipal Engineer, waive submission of any of the requirements in Subsection C(1) through (6) of this chapter when it can be demonstrated that the information requested is impossible to obtain or it would create a significant economic hardship on the applicant to obtain and its absence will not materially affect the review process. Applicability. Projects subject to review pursuant to § 166-1C of this chapter shall comply with the requirements of Subsections B and C of this section. The design engineer shall prepare a maintenance plan for the stormwater management measures incorporated into the design of a major development. This plan shall be separate from all other documents, in a format suitable for recording in the County Clerk's office and designed for ongoing use by the site owners or operators in performing and documenting maintenance and repair, and by the municipality in ensuring implementation of the maintenance plan. The final maintenance plan shall be updated and provided to the municipality post construction to include an evaluation based on the specifications of the initial maintenance plan and as-built conditions. The maintenance plan shall contain specific preventive maintenance tasks and schedules; cost estimates, including estimated cost of sediment, debris, or trash removal and disposal; safety needs; identification of methods and disposal sites for materials removed during maintenance; maintenance requirements for created wetlands and other ecological systems; safety devices and systems; warranty and operational standards from the manufacturers of any manufactured treatment devices (see § 166-6C); and the name, address, and telephone number of the person or persons responsible for preventive and corrective maintenance (including replacement). Maintenance guidelines for stormwater management measures are available from sources listed in § 166-7, the municipal stormwater management plan, municipal stormwater pollution prevention plan and any relevant regional stormwater management plan. If the maintenance plan identifies a person other than the developer (for example, a public agency or homeowners' association) as having the responsibility for continuing maintenance, the plan shall include documentation of such person's agreement to assume this responsibility, or of the developer's obligation to dedicate a stormwater management facility to such person under an applicable ordinance or regulation. Preventive and corrective maintenance shall be performed to maintain the function of the stormwater management measures, including repairs or replacement to the structures; removal of sediment, debris, or trash; restoration of eroded areas; snow and ice removal; fence repair or replacement; restoration of vegetation; and repair or replacement of nonvegetated linings. The person responsible for maintenance identified under Subsection B(2) above shall maintain a detailed log of all preventive and corrective maintenance for the structural stormwater management measures incorporated into the design of the development, including a record of all inspections and copies of all maintenance-related work orders. The person responsible for maintenance identified under Subsection B(2) above shall retain, submit annually to the municipality and make available, upon request by any public entity with administrative, health, environmental, or safety authority over the site, the maintenance plan and the documentation required by Subsection B(6) and (7) above. The requirements of Subsection B(3) and (4) do not apply to stormwater management facilities that are dedicated to and accepted by the municipality or another governmental agency of competent jurisdiction. In the event that the stormwater management facility becomes a danger to public safety or public health or is in need of maintenance or repair, the municipality shall so notify the responsible person in writing. Upon receipt of that notice, the responsible person shall have 14 days to effect maintenance and repair of the facility in a manner that is approved by the Municipal Engineer or his designee. The municipality, in its discretion, may extend the time allowed for effecting maintenance and repair for good cause. If the responsible person fails or refuses to perform such maintenance and repair, the municipality or county may immediately proceed to do so and shall bill the cost thereof to the responsible person. Maintenance guarantee. Nothing in this section shall preclude the municipality in which the major development is located from requiring the posting of a performance or maintenance guarantee in accordance with N.J.S.A. 40:55D-53. Right of access. The maintenance plan shall specifically provide a specific municipal right of access for inspection of measures, and for maintenance if required under Subsection B(10). Any person who erects, constructs, alters, repairs, converts, maintains, or uses any building, structure or land in violation of this chapter shall be subject to the penalties as prescribed in Chapter 1, General Provisions, Article II, of this Code. This chapter shall take effect immediately upon the approval by the county review agency or 60 days from the receipt of the ordinance by the Hunterdon County Planning Board if the Hunterdon County Planning Board, as county review agency, should fail to act.